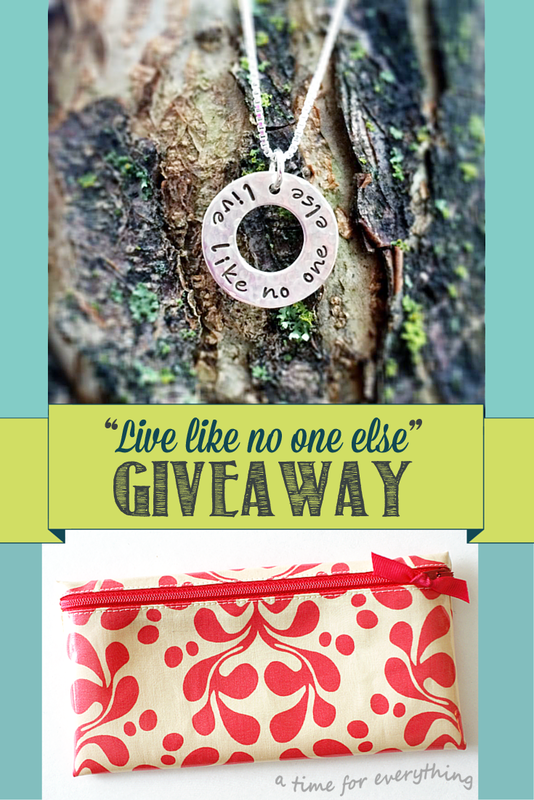 Giveaway: Live like no one else! I’ve been so excited to share this giveaway with you! When I agreed to contribute a Divide-It Wallet this week for a “favorite things” series by my friends Kristin & Kendra at As You Wish Design, they offered a necklace for one of my readers to win. I mentioned that it would probably go over big if it said “live like no one else” but then quickly realized they wouldn’t have anything already made and photographed, so I said never mind. I didn’t receive a response back from Kristin until later in the day when she sent me a picture of the necklace she had just made exclusively for this giveaway. I’m not a squealer, but I think I made an exception! For the required entry, all you have to do is leave a comment sharing one thing you’re currently doing to “live like no one else” and then submit your entry via the Rafflecopter widget below. There are also optional actions for extra entries. The contest is open to US residents age 18 and over and ends 12/12/14 at 11:59 PM PST. The winner will be posted on 12/13/14 in the Rafflecopter widget as well as contacted via email. After you enter, I hope you’ll take a few minutes to visit As You Wish Design to view their wonderful selection of sterling silver jewelry and also check out their social media accounts. We live debt free and say no to the brand new often so we can one day have more to give to others! Thanks for the giveaway!! We did great paying off debt and are credit card debt free. Now to work on student loans. I have struggled lately staying on budget and keeping spending under control but am determined to get back on track. We just cut up our credit card (right before Christmas! ) and are making a huge effort to live life more frugally. We are working on paying off debt! We make yummy treats to give away at Christmas – truffles, fudge, cream cheese mints, and chocolate covered pretzels! We are saying no to credit cards!! We are working to bless others by opening our home. We have several friends that are going through some very big life changes. Our house is open to them for conversation, a meal, a place to stay … whatever we can give. Thank you for hosting a fantastic giveaway. I live debt free except for my house. We are figuring out how to work less but make more so that we can spend more time with our kids, enjoy life, visit more with family and just have fun–every day! We started our debt free journey in February and were able to shave off $20000 off our debt so far :) I use coupons, and customerpoints and craft things for Christmas. It works !!!!! I am a therapist to troubled youth and adolescents. Every day I work with them in therapy helping them overcome their past, abuse, and living my life to the fullest and the best of my ability because I know for many of them I am their role model. We are paying on our debt aggressively and postponing our wants to do so. We are committing to living more frugally and pay off our debt. We are striving to pay off our debt and live simply. we have chosen to scale back on gift giving and focus on the many blessings we already have! We drive cars that are paid for!! We’ve cut up our credit cards and only have our mortgage as debt. It’s a choice we make daily and it’s not easy but it’s worth it!! My husband and I working on paying off my car. Here is to living life debt free! My husband and I have been debt free since one month before our wedding! (Yes, we paid for wedding and honeymoon with cash!) We continue to budget and use the cash envelope system for most of our purchases. We are on Dave Ramsey’s baby step 6, planning to pay off our home in 8 years or less! We don’t buy on credit, and are working on paying off medical bills. One of our cars is paid for and we are continuing to drive it with over 200,000 miles on it! I have started making personalized gifts to encourage people just when they need it. We are doing the debt snowball and paying off our debt…one loan to go! I am working my way towards a mostly homemade Christmas! We have almost paid off all our credit card debt and our goal for early 2015 is to pay off one of the cars and get rid of it and be a one car family for a while until we can cash flow a new-to-us car. i have just recently found the Lord. Each day I try to live my life for God. He has blessed me with so much and I am thankful every day. We are driving a car that’s more than 14 years old so that we can live without a car payment and pay off our student loan in half the time! My husband and I live debt free and keep each other accountable to unscheduled spending. We review our budget together and bank account twice a week. Honestly,I used to dislike this but as we have built discipline the healthy boundaries have given us both more freedom and we are able to enjoy the spending we do without guilt or worry. We trust God with our finances and know that life happens and we are budgeting for it. I did not grow up with this model but am thrilled to have learned it as an adult. Financial freedom is truly freeing. Saying no to credit cards and debt! Working to take care of my health and no credit debt. We spent 52 months paying off A LOT of debt and we’re so excited to scream “WE’RE DEBT FREE” on Dave Ramsey’s radio show – LIVE! And then taking the kids (6, 8) to Disney World to underscore the achievement and sacrifice. Yes, we’re paying CASH for all of it! We’re having a 100% debt-free Christmas for the second year in the row! We might not be able to give our boys a ton of gifts because we have to save up, but it is so, so worth not having a financial hangover in January! :) Thank you for this amazing giveaway! I started a new home business to earn some extra cash for a new car a my kids’ tuition! Praying God will turn it into an amazing blessing! We are trying to get rid of debt so we can live more freely. Well, I know I’m not the only one doing it, but one thing we are doing that we never expected to be doing is homeschooling our four kids. Never thought we’d be here but it’s awesome. Speaking of awesome ~ love the necklace and the color of that wallet!! We do without so much so that I can stay at home with my kids. This season I am remembering what is most important. gratitude, generosity, and hope. I live like no one else by riding my bike to my jobs. It is not a far distance, but it is a passion of mine. I hope that I inspire others to do this simple act, which is amazing for the environment and for our physical and mental health. I love it when the crows sing “caw caw” at me as I’m pedaling along..it makes me laugh and cherish my daily commutes. My husband is currently deployed, which means that he gets a little extra pay while he is gone and some of our expenses at home are decreased (gas, etc.). So we are using that extra money, plus the money I’m able to save in our budget, to pay off our student loans.